Winter tends to wreck havoc on many things including your home. The last thing you want to do is walk into your home from the frigid temperatures to find leaks in your house. Climbing up on your roof and doing repairs in the middle of winter probably isn’t on your bucket list. When it comes to water getting in your house, typically it has something to do with your home’s structure, i.e) roof, foundation, etc. There are small tasks that you can do to help prevent winter from taking its toll on your home. Prepare for winter with roof repairs and maintenance. One of the most important parts of your home is the roof. The roof of your home is what provides you shelter from the elements. What good is it if those elements are getting into your home? By preparing your home for winter you can save time and money from more extensive damages when all of the ice and snow melts next spring. Clean and Re-Hang Falling Gutters- During the winter as ice melts water runs through the gutters. When that water re-freezes, it causes ice to form inside of your gutters. By cleaning out your gutters before winter, yet after the leaves have fallen, you will create an empty path for that water to run, reducing the accumulation of ice or icicles. 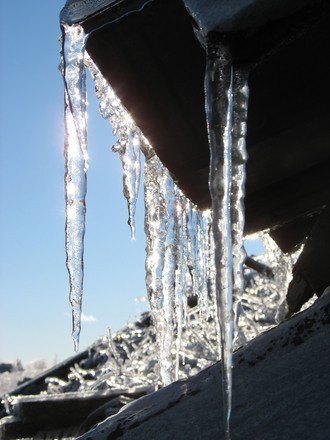 When ice or icicles form in or on your gutters, they have to strain to hold all of the extra weight which may cause them to rip off the side of your home, creating more damage. Replace Damaged Shingles- You may notice some of your shingles have been damaged, are missing, or need to be replaced. Shingles provide a waterproof barrier between the elements and your home, so ensuring that they are in good shape is a must. Snow and ice as it accumulates on your roof tend to add weight which can pull down shingles if they are damaged. Sure, you can get out the ladder and take care of these simple repairs and maintenance yourself, but save time and energy by letting the professionals do the dirty work for you! (that gutter sludge can be pretty gross!) Be sure to check out our great fall specials, saving you money as you prepare for winter with roof repairs and maintenance this fall! Think your roof needs more than just simple repairs? It may be time to replace your roof altogether. Read more. Contact us today to get a free quote on your roofing needs! This entry was posted in Roof repair, Roof Specials, Shingles and tagged clean or replace gutters, replace damaged shingles, roof repair michigan, roof repairs and maintenance, winter roof inspection. Bookmark the permalink.